This versatile Flow Controller switch may be used to establish flow/no flow control of metering pumps in various applications. 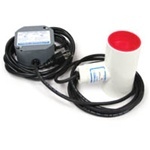 The pre-wired, self-contained flow switch is specifically designed for the water treatment industry. Turns feed pump on at 0.5 gpm with a maximum operating pressure of 150 psig.